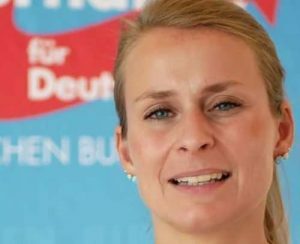 Corinna Miazga is a member of the German parliament for the anti-immigration AfD party. In an interview, she examined the implications of the UN Global Compact on Migration which Miazga believes is a EU globalist project. As early as March 2018 the European Commission wanted the Council of Ministers to sign the Global Compact on Migration, which governs development co-operation for the entire EU. Two answers recently given to the German Bild newspaper by the Federal Foreign Office made it clear that the cap set on migrant family reunification that was decided by a German coalition agreement will not be removed, since the above-mentioned cap only applies to asylum. The answer to the second question posed to the Foreign Office about whether the Global Pact would treat “climate migrants” the same as refugees was a very clear “no”. Miazga says these are two pivotal responses showing that the legal framework for open borders in Germany does not yet exist. But would the Commission, Council of Ministers or ultimately the institutions of the EU have the authority to oblige member states to sign the Global Migration Pact? To that important question, the answer is “yes” they do, and the establishment parties especially in Germany, are responsible for this development, Miazga says. “Politicians who signed the agreements for the transfer of German sovereign rights to the European Union with the Maastricht Treaty in particular, but also the Lisbon Treaty, saw to it that the EU was legitimized, although it still has to operate according to rules,” according to Miazga. But in the field of legislation there is something called a subsidiary procedure. This agreement or Pact, which obliges the member states to take in large numbers of migrants from non-member countries, is not recognised by the EU as a legal act. “Thus, the European Union, in incorrectly classifying the Migration Compact by not recognising it as a legal act, can skillfully circumvent all inspection, especially subsidiarity tests and deadlines,” Miazga explained. “But the complex plan [of introducing open borders] of the EU or the Commission has failed. At the end of April, according to documents from the Federal government of Germany, there was no agreement at the ministerial level. The Migration Compact thus allows all future migrants access to social systems to which they contributed nothing, and most likely will not contribute to in the future. In addition, the migration pact only mentions the rights of the migrants and the obligations of the destination countries. Miazga points out that “duties of the migrants in regard to the countries that accept them and provide them with support perhaps for their entire life — are non-existent”. She says there is no profile of requirements in terms of integration capacity, education or qualifications — as in the 2009 Blue Card EU directive. “The reason is quite simple. The Migration Compact is not a plan to promote so-called labour migration or to recruit professionals from non-member countries. It is simply about poverty migration. “For all those who still claim that the EU has no regulation at the international level on the issue of labour migration from non-member countries to countries in the EU, you are in for a surprise. The Migration Compact in fact applies to all those who are not eligible to receive asylum or do not qualify for receiving a blue card. “These individuals will now have the so-called ‘collective’ paper, the collective agreement, the Migration Compact, and will soon have the legal right to cross our borders. To disguise such problems, the Migration Compact calls on the media to report on the benefits of immigration in terms of “enriching society” and to prohibit all negative reporting. A passage from the Global Migration Compact clearly states that “public funding or material support of media that are systematically intolerant, xenophobic, racist or practice other forms of discrimination against migrants will be discontinued”. Miazga argues that the UN Agenda 2030 from 2015 already tried to do away with borders. “In addition to that, the EU published a very interesting study back in 2010 called ‘Study on the Feasibility of Establishing a Mechanism for the Relocation of Beneficiaries of International Protection’.